I think it would be fair to say we have had an unusually large amount of illness in our little flock recently. I know spring is a bad time for hens with all the demands of the new season on their little bodies but even so I think we have been particularly unlucky. We lost Bertha, have had Bunty’s prolapse, soft shelled egg issues from Daisy and Effie, Constance’s bleeding vent, Evie’s water belly…the list goes on. 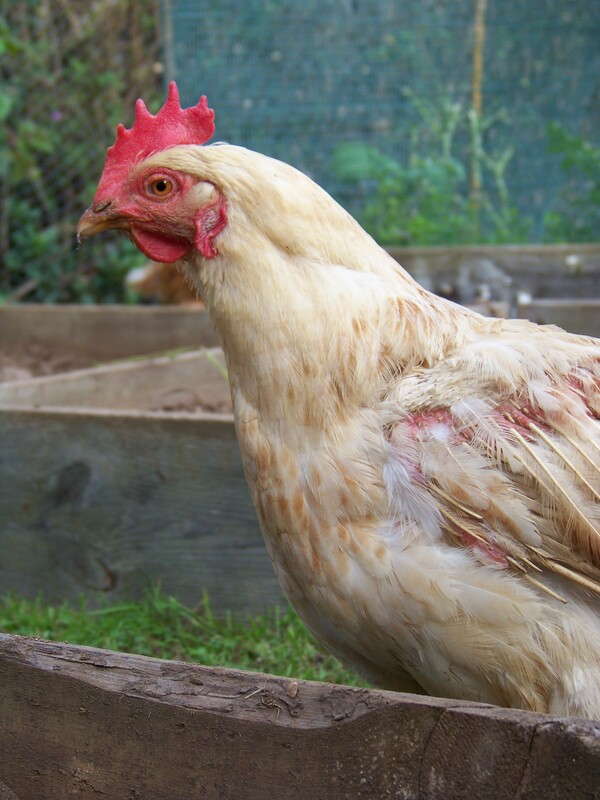 When I had my first hens – I had to have ‘hen holding practice’ beforehand – I knew next to nothing about them, least of all how to diagnose and treat a sick girl. Had I known what I know now, I think I could have maybe saved Aurora and Agatha. I don’t know, it is too upsetting to think about but I think every sick girl you have teaches you something new that you can use to help one of their sisters at a later date. Personally I can never know enough and am still learning so much from both my girls and some real chicken experts. I think the most important thing is to find a good chicken vet. Vets are quickly cottoning onto the fact that more and more people are keeping hens as pets and organisations such as Chicken Vet run courses and support for vets interested in supporting this new, rapidly developing area. There is a list of accredited vets here. My local vets have been amazing – especially recently – I have gone in with numerous requests and demands and they have done their very best to accommodate me and my girls. Anything they have not known about, they have researched and then undertaken. From learning about Superlorin implants to scouring Cornwall for Nystatin or performing purse string sutures on Bunty’s prolapsed vent. I think in these early days of ‘hens as pets’ it is good to go to the vets with an idea of what is wrong and what the best treatment is. Wanting to avoid the ‘hypochondriac with mild symptoms and a medical dictionary’ syndrome I try not to just wildly google my girls symptoms but instead refer to a good, reliable website. By far the best I have found is poultrykeeper with their interactive and really helpful Diseases and Disorders section. It gives you an informed and useful starting point to diagnose your girl’s ailment and also has a forum for more obscure questions. I find it much easier to go to the vets with an ‘I think my hen has XYZ and needs ABC’ than to go in cold. Another valuable source of information is Twitter. 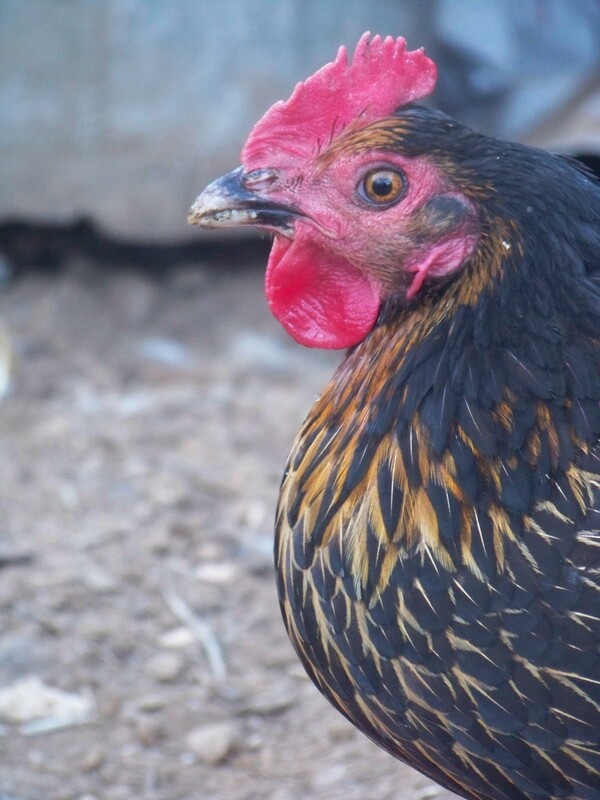 By following chicken experts such as @avianvets, @chickensaspets (both of whom have been invaluable in my battle to beat Brigit’s sour crop Avian Vets ), @chickenvet @chickenstreet and @poultrykeeper you will learn a vast amount about chicken health. Here I must declare my ‘interest.’ Poultrykeeper have an ex-batt section with a writer you may recognise! Quite frankly I am honoured to be allowed to write for them – there are some real chicken experts writing for the site, I am in esteemed company! Talking of writing…if anyone reads Smallholder magazine, then reserve your May copy now!!! Not only is the cover girl a stunner but it also features my article!! 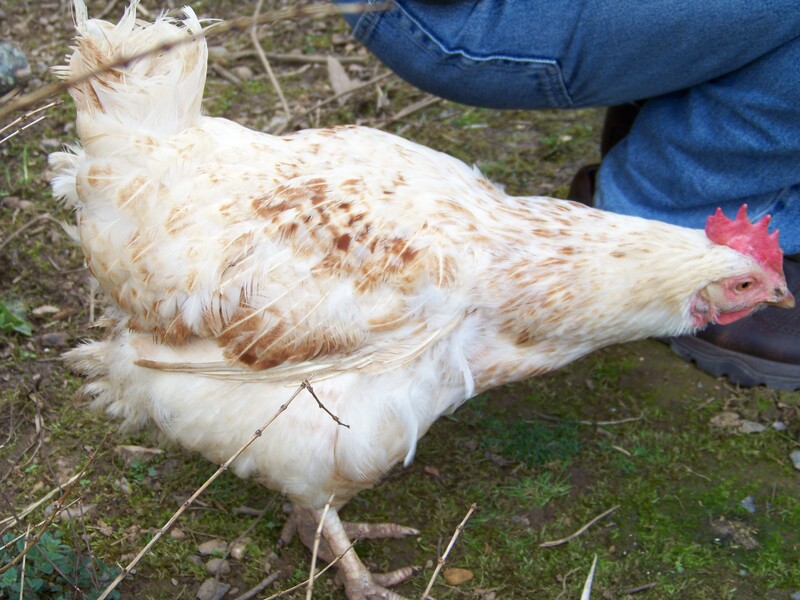 This evening we said a tearful goodbye to Miss Bertha Chicken, the first of our B girls to leave us. 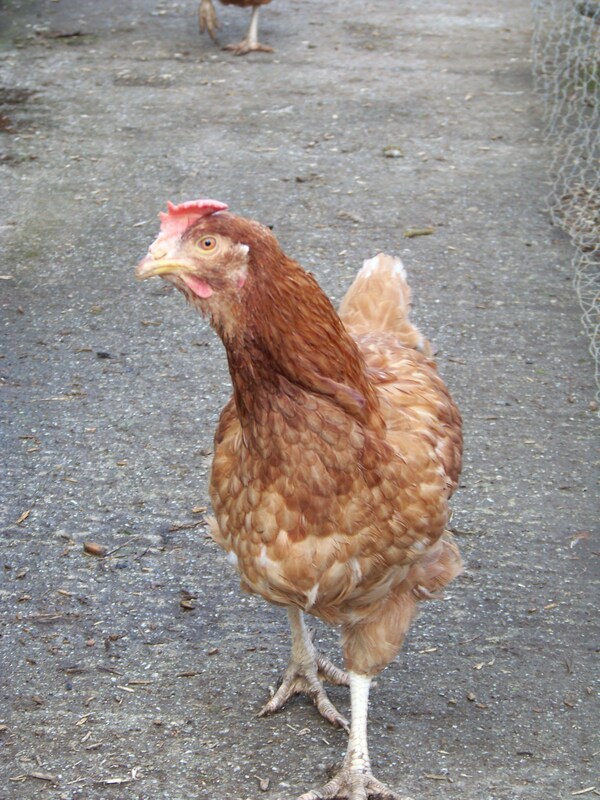 Just a month after celebrating her one year henniversay, our darling Bertha has gone to join Audrey, Agatha and Aurora hunting worms in henven. 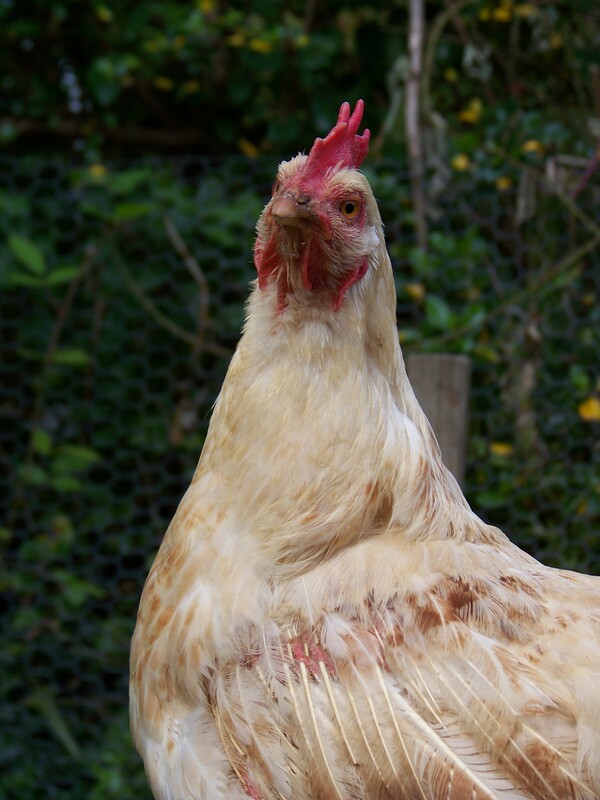 Bertha was always a beautiful girl, her bald patches soon replaced with creamy white feathers and she was a splendid egg layer – an egg a day as regular as clockwork. Bertha’s best friend was fellow blonde girl Brigit and the two very quickly became like a pair of endearingly cantankerous old aunts. They did not take kindly to the introduction of the C girls – taking it upon themselves to terrorise Clara, consequently alternating it between time out thinking about their actions in the Naughty Coop. Once the D girls arrived Bertha was so put out that she took it upon herself to sleep alone (very Great Garbo) each night in the Hermitage – named especially for her. She tolerated the new girls during the day (just) but refused to give up her comfortable sleeping quarters for them. This continued for some time – each evening watching as the others went to bed in Henderlay before tootling off to her own little Hermitage, happy in her splendid isolation. Only when the E girls arrived at Christmas and Bertha’s coop was requisitioned for Effie and Eleanor did Bertha finally deign to rejoin her sisters in Henderlay. She pretended not to but I think she quite enjoyed it. 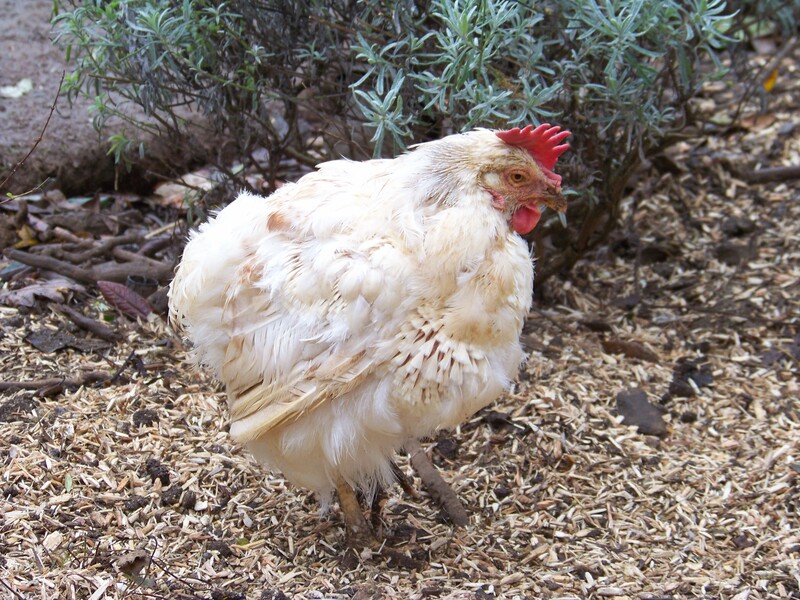 Turfing the younger hens out of the prized bedtime nestboxes – only for them to pile back in on top of her. Such indignity. Last Wednesday, Bertha started to look a little off colour. Brigit was suffering from one of her episodes and the pair of them stood in the corner of the garden looking a bit grumpy. By Thursday though Bertha was really quite unwell and after checking for anything obvious – bum, tum and crop – we resorted to some of the vast quantities of hen medicines we have accumulated. We tried to tempt her dwindling appetite with treats of egg and cat food, even syringing a little egg in at times. We put sugar in her water to give her a little energy, kept her dosed up and kept our fingers crossed. Gary spent Sunday afternoon digging worms for her. She only managed two. Each morning we feared finding her gone but each morning she was still with us. Fighting to the last. Knowing she would much rather be outside than in, each day we carried her outside in a nestbox and tucked her up under the Rainy Days shelter with little bowls of water and treats. Bunty Goodchicken, Brigit and Bella all stayed in the shelter with her each day, in shifts of two at a time, so she was never left alone. 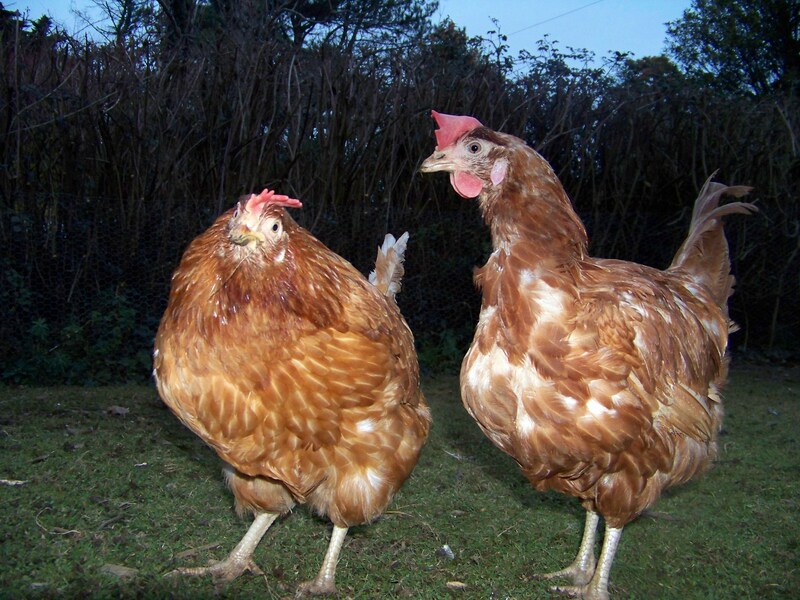 Anyone who doubts that chickens do not form friendships or feel empathy for each other, should have seen these girls. They knew their sister was ill and they kept a vigil by her bedside. She started to show small signs of improvement. On Sunday night I thought we had cracked it, she wolfed down a bowl of egg for supper. I was however putting off the inevitable – no matter how hard we wanted to see her getting better, she wasn’t. At some point we would have had to make The Decision. But she spared us that, bless her. This evening, Bertha had taken herself from her daytime shelter, up the Henderlay ramp and inside. She already knew what we didn’t. We gave her some medicine and Gary tempted her with a little egg, before placing her back in the coop. Bunty was in there looking after her but seconds later came running out to tell us the bad news. Bertha had had a heart attack and died. What little consolation we had was that she died quickly, where she wanted to be and she wasn’t alone. Our poor, beautiful girl – we tried so hard to save you. She was wrapped up in a pink blanket to keep her warm with a daffodil just because all ladies need flowers, before being cremated. We watched as her spirit soared to henven amongst the orange flames. A very sad moment. 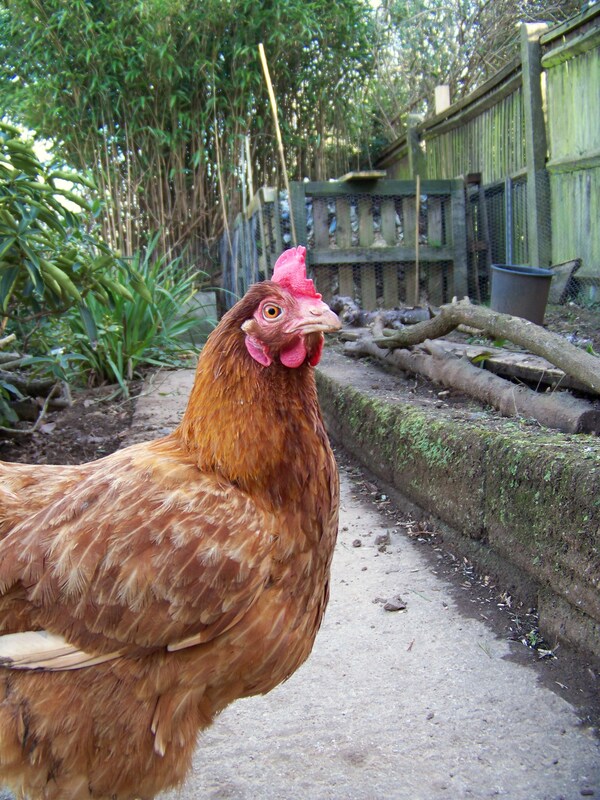 But we shall remember our darling Bertha with love and a smile – dustbathing, foraging, sunbathing, her fabulous egg laying and her free range happiness. Fly high, little hen. Feel the sun’s warmth forever on your wings.